Nerd girl who likes transformers, Overwatch, and SCP Containment Breach. Not much to say I also love Wings Of Fire. Follow my sister @Stevebow. I don't have a lot of purposes on Scratch anymore. What should I do? Read desc. 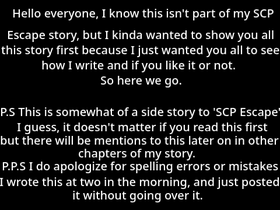 | SCP FOUNDATION | RP | Secure. Contain. Protect.